Buy or Rent Proll Out (2012) Movie DVD & BluRay Online! 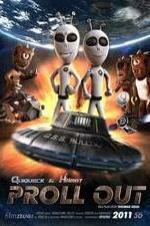 Movie Plot: Quiqueck & Hämat, two typical everyday aliens, are orbiting earth to observe mankind. One day the bad Prollians, one-eyed redneck-idiots from Outer Space, are attacking. An extraterrestrial battle breaks loose.